With all the excitement and buzz around social networks, I have been favoring them as a source to warm up cold calls. In a recent project I called a particular department within hospitals to learn about their usage of a specific technology. I got lucky and found an association which listed chapter leaders around the US who worked in this part of the hospital including phone numbers. That was sure a stroke of good luck. However, after connecting with about 20 of them I realized that I didn’t have enough interviews to give my client the information they needed to develop their opportunity analysis for this new product. I had a list of potential hospitals filtered according to the number of specific procedures which might require this new technology. I figured I could find people to call through LinkedIn by identifying the hospital and job title using the advanced search feature. Armed with some names I would warm up the calling process. I spent about an hour and I really came up short. I was disappointed since with other projects LinkedIn and/or Twitter had been more helpful. Instead I Googled and got the phone numbers for a goodly number of hospitals. I called the main number at each hospital and asked to be transferred to the appropriate department. It wasn’t so straightforward since hospitals don’t all call this medical area by the same name. However, I managed to get through to another 20 hospitals through cold calling. I was pleasantly surprised that one of my best interviews, with one of the largest US hospitals, came through a cold call. In cold calls, the person answering the phone often didn’t know the information I was seeking, but would find out who did, and would transfer me to the right person or give me their telephone number to callback later. It was a wake-up call for me. Although this wasn’t a competitive intelligence project, it reminded me that the same technique often works when you cold call regardless of the reason why. You organize why someone would want to talk with you by putting yourself in their shoes. Early in this project I listened in on a conference call where managers in this medical discipline were being interviewed. I learned how they were motivated, and developed my approach around that. I also read up on the technology and competing technologies, so I could ask better questions or use elicitation skills to get more information depending on how the person answered me. Not everyone was helpful, but I would say about 90% of those I connected with tried to be helpful based on what they knew about the technology I was querying. I don’t know how else I could have completed this project in about 70 hours. Cold calling does take nerve since they often don’t go as you plan them. I find that if I don’t take myself too seriously and listen really closely, not just to the words, but to the tone and attitude, I am pretty successful. It helps that I have been cold calling for a while so have built up some confidence. Cold calling can still be a real time saver, and in the case of the project I am just concluding, it was a fast and effective way to get the client the information they needed to forecast their opportunity to sell a new product! 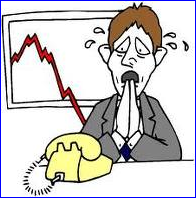 What are your experiences in cold calling?